I can distinctly remember, many years ago, constantly being intrigued by the title of a short (usually around five minute) show which regularly appeared in the afternoon schedule of the regional ITV company Westward. Westward bordered our own ITV region and, as a rule, its schedule pretty much matched our own. yet every weekday there was this anomaly...a peculiar programme which I was never able to view entitled Gus Honeybun's Magic Birthdays. Not being able to watch meant that I had no idea who this Gus Honeybun was. In fact I had remained blissfully ignorant until recently, when approached by a friend in my local and the subject of Gus Honeybun came up. For Gus made a record - sort of. A badly stuffed toy rabbit, Gus Honeybun was the station mascot for Westward Television, (which later became Television South West and, later still, Westcountry) from 1961 to 1992. In terms of longevity, he is reputed to have had a career in television second only to that of Sooty, the little yellow bear glove puppet and his cronies Sweep and Soo. Like many puppets, Gus's appearance changed over the years - there were at least four different toys used during his three-decade career. Devised to fill time during unsold advertising slots, Augustus Jeremiah Honeybun (to give him his full name) was supposedly found under a gorse bush on Dartmoor. Appearing with presenters including Fern Britton and Judi Spiers, Gus wasn't the only puppet to be employed by an ITV regional franchise: ATV famously had Tingha and Tucker (the two little bears) and the device was stolen wholesale by BBC who launched Gordon the Gopher, Edd the Duck and others to national fame. During Gus's shows his human friend would read out birthday wishes to viewers (who were supposed to be aged 12 and under), and the fat, mute rabbit would bounce up and down (often with the arm of his operator clearly in view) and occasionally headbutt a cardboard lever which would 'magically' transform the backdrop. The wonders of technology. So great was Gus's following locally that a 45 was issued - in both black vinyl and picture disc versions - of a brace of songs inspired by Gus and written by composer Ed Welch. Probably best known for his work with the legendary Spike Milligan, Welch wrote the theme tunes to many TV favourites including Blockbusters, Catchphrase, Thomas the Tank Engine and Friends and even the National Lottery programme. 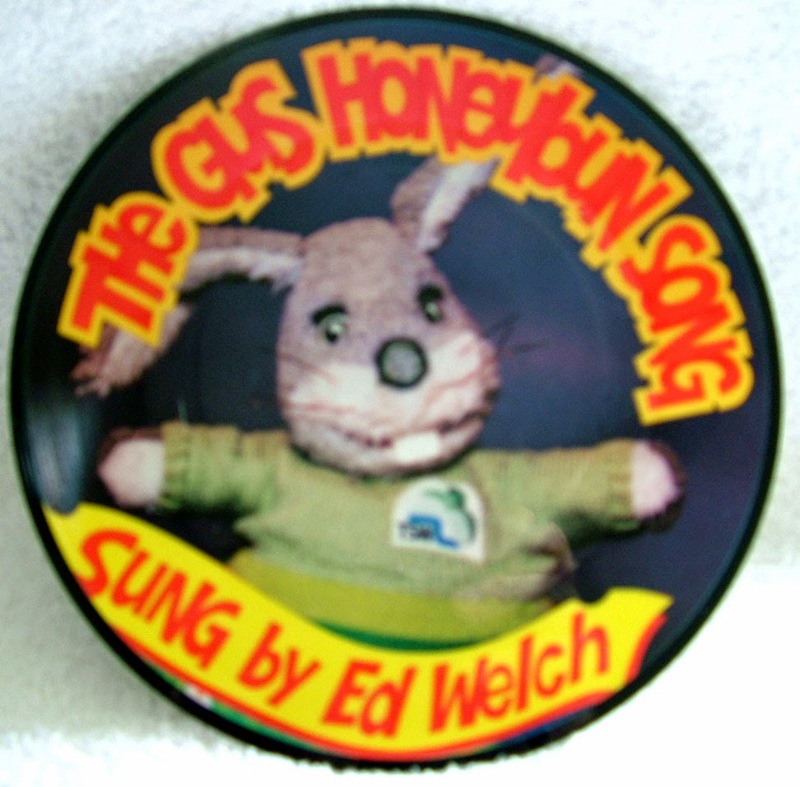 He also wrote and performed both sides of this stinker The Gus Honeybun Song and Happy Birthday Gus Honeybun. Unfortunately, Gus's career could not last forever: after several changes in franchise ownership he was deemed to be passé by the powers that be and in 1992 he was reunited with his massive rabbit family on Dartmoor. Still, thanks Andy for reminding me about Gus and here for you - and for everyone else, of course - are both sides of his one and only 45. I’m pretty sure, despite encouragement to include such people as Wild Man Fischer, that I’ve ever featured people who were clearly mentally ill in this blog before: deluded, certainly, but not fit to be institutionalised. Before last week I had never heard of Jerry Solomon. Now he’s becoming something of an obsession. According to his own short autobiography, Jerry was ‘born in San Diego, California and lived in Boyle Heights from age 1-4. Later we moved to West L.A. where I went to grade school and attended Hamilton High. After high school I had a job delivering fur coats. Then I got into show business, singing, dancing, and doing comedy routines. ‘In my 30's I was maliciously given a dangerous drug as a "joke" and suffered brain and heart dysfunction. Over a ten-year recovery period, in the last few years, I've regained to some extent, my former function and am writing a book about my experience.’ That book – A Drug Free Life and a Glass of PCP – is available now. Jerry somehow managed to record several albums, including Past the 20th Century (Fountain, 1971), Live at the Show Biz (Fountain), and Through the Woods (1973, label unknown) (UPDATE: according to record collector and private press archivist Mike Ascherman, Jerry's recorded output consists of 3 LPs and 13 45s and EPs). They are all completely insane; Jerry rambles, croons, hoots and shrieks through his material like a crazed psychotic. It’s no surprise that Andy Kaufman was reputedly a fan. Very few copies of these albums exist: so sought after are they that when they do come up for sale it’s usually for stupid money. 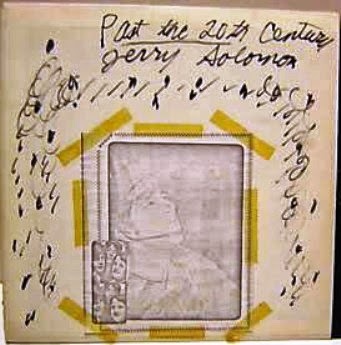 Most come without sleeves: when they do have covers they are usually handcrafted by Jerry himself and often have photocopied inserts or doctored photos taped to them. What’s really frightening about these records is that they were recorded BEFORE Jerry’s mind wet AWOL: he states (in his short story Living in an Altered State) that his overdose happened in 1977. Hell, if he was recording this kind of acid casualty stuff before he fried his synapses what on earth would have been the results of a recording session during his lost decade? Now aged 70, pretty much fully recovered from his journey into the unknown and calling himself a ‘performance artist’, Jerry is still desperately trying to carve a showbiz career for himself. He recently auditioned (unsuccessfully), for America’s Got Talent, singing a self-composed song about Viagra to the tune of O Sole Mio. In the past he had his own cable show – a couple of uncomfortable-to-watch clips are on YouTube. Here are a couple of cuts from Jerry seminal masterpiece Past the 20th Century. Enjoy! Fans of old movies, and anyone who’s ever watched a western on a wet Saturday afternoon, will have fond memories of the actor Walter Brennan. Forever the amiable, often irascible, sidekick (as he was to John Wayne in the classic Rio Bravo), Brennan is the only actor ever to win three Best Supporting Actor Oscars – and one of only three actors to win three Oscars throughout their careers (the other two being Jack Nicholson and Daniel Day Lewis, fact fans). Born in 1894, Brennan began acting in vaudeville at the age of 15, but it wasn’t until the late 20s that he started getting bit parts in the movies: apparently he was forced back into acting after losing the fortune he had made in real estate during the stock market crash. He appears, uncredited, in Horse Feathers (the Marx Brothers), The Invisible Man and Bride of Frankenstein amongst countless others, but it was his role in the Howard Hawks/William Wyler drama Come and Get It (1936) which first brought him to prominence, and won him the inaugural Academy Award for Best Supporting Actor. In a career that spanned almost 50 years, his ‘grumpy old man with a heart of gold’ shtick added colour to many a movie and, from the 1950s, he was a popular star of American TV, with the lead role in early sit-com The Real McCoys. But we’re not interested in his acting prowess: oh no! For Walter Brennan also released more than a dozen (honestly! A dozen!) albums. After narrating an album of Mark Twain tales in 1956 and continuing with the obscure By The Fireside, his recording career got off to a real start with the 1962 release Dutchman’s Gold. 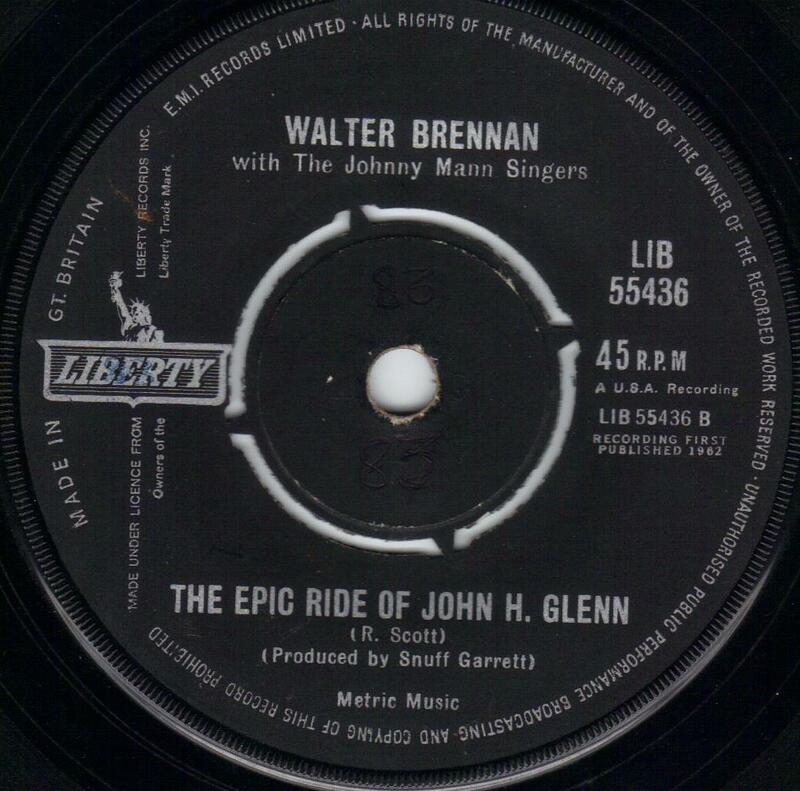 Many of these records – with their painful, hokey, homespun, spoken word performances – sold by the bucket load and even garnered him a couple of hit singles the biggest of which, Old Rivers (the tale of a young boy’s friendship with an older man and his mule), made the US Top Five! 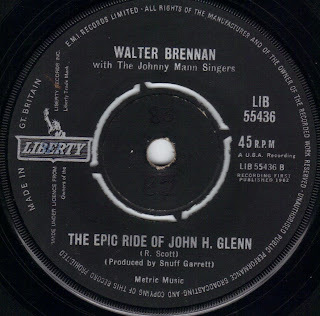 So here’s a smattering of cuts from Walter Brennan, including both sides of his biggest hit Old Rivers/The Epic Ride of John H Glenn (which I was lucky enough to pick up whilst on holiday recently and which charts the career of the first American to orbit the earth), and his horrific version of the Mel Tills/Kenny Rogers classic Ruby, Don’t Take Your Love to Town.